Considering I have zero artistic talent to paint a picture and I know nothing about art, finding and understanding golf art is certainly a challenge. Although golf memorabilia is appealing to me, my wife would never allow me to put up a picture of Arnold Palmer or Tiger Woods in our home. Over the holidays I spent some time looking for some really cool pieces and came up with 5 places that offer awesome golf art. Be sure to check out these cool golf art sites. Enjoy! Lee Wybranski – Ever wonder who designs those really cool posters that you can buy in the merchandise shop at golf tournaments? Lee Wybranski is a well-known artist and designer who does work for most of golf’s governing bodies. Lee’s work is mostly in watercolors. He has been commissioned to do work for some of the finest golf courses in the world such as Pine Valley and Cypress Point. Lee does some amazing stuff and is very well known in the golf art world. Check out Lee’s gallery. Sterling Watercolors – Sterling Desantis is not your typical artist as a college student and NCCGA club golfer from Georgia Tech, but he creates some pretty cool water color art. 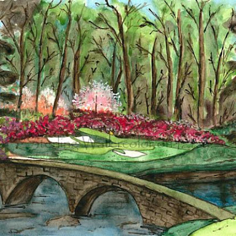 He mostly focuses his art on Augusta National, but can create custom water color art if you have a request of your favorite golf hole. I like artists like this who are creating work out of passion for the game and are not in the business of selling art as a full-time career. Check out Sterling’s gallery on Etsy. Lie and Loft - Whether you are looking for a tasteful routing of one of your favorite courses or a colorful, unique view of Amen corner, this site has many options. The costs for prints are reasonable and you have the ability to customize pictures with all different types of frames to match your style. The story behind Life and Loft from Luke Davis is pretty neat as well. He is a passionate golfer and designer who just saw an opportunity to create some tasteful golf art and a unique business. Check out the gallery. Linda Hartough – I had never heard of Linda until searching for golf art, but her golf landscape work and paintings are famous! She does a lot of formal oil painting golf art for Augusta and many major championship locations. If you have a testimonial from Jack Nicklaus on your site, your art must be pretty special! 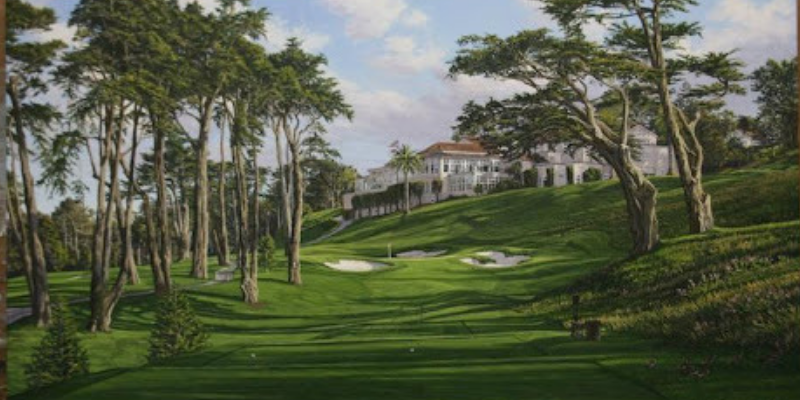 Check out some of Linda’s world famous golf art including the soon to be finished 9th hole portrait of the Olympic Club seen above.